I have a sweet tooth. There’s no getting around it. I taught myself to bake mostly because I wanted to eat amazing cakes, cookies, tarts, pies…. There is an amazing thing that happens to me when I bake though. I don’t usually have to eat very much of what I make. The process of baking and creating something from scratch and the delicious smells that comes out of the oven are usually enough to satisfy me. I can get by with a little bite or two. But if someone else made the same dish, I fall upon it like a starving Hyena. I have no idea why. Right now, I’m doing a Master Cleanse. If you’ve never heard of it, go check it out on this site. Basically I’m drinking a lemon juice, maple syrup and cayenne pepper concoction for 16 days…NO FOOD. I figure that at least once in my life I should do some heavy duty cleaning from the inside out. Anyway, I still have been baking, cooking, working normally. I won’t lie, sometimes it’s been really hard not to eat, especially when it smells so great. The hardest thing though has been trying to figure out if textures and tastes turned out okay on recipes that I’m putting together. Like these cookies for instance. I know in my brain that the combinations of ingredients should turn out great. I haven’t tasted any though, so I’ve been taking them around to co-workers and family to find out the verdict. I wanted something that was slightly crispy on the outside but chewy on the inside. 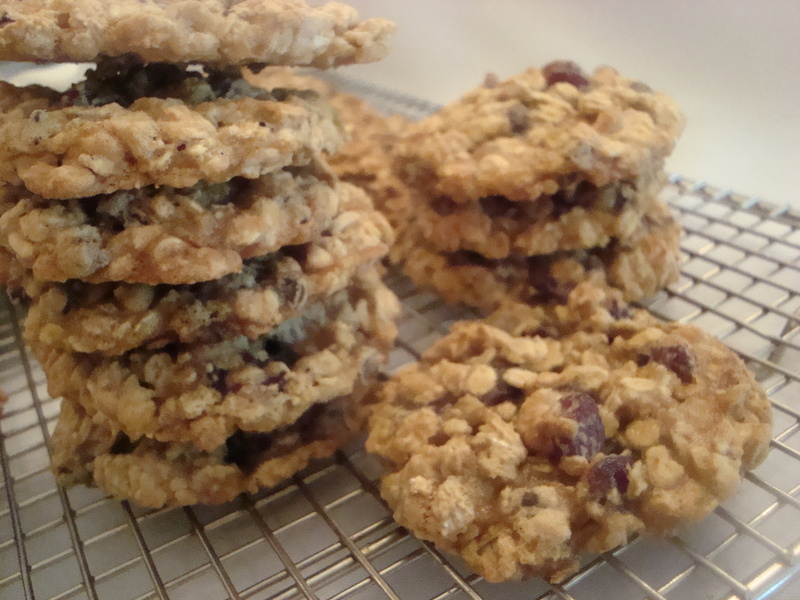 The sourness of the cherries to be balanced out by the sweetness of the chocolate chips. I’m told that I’ve succeeded. So, now you’ve got to try it out and see for yourself. Pre-heat oven to 350°F. Cover a cookie sheet with silpat or parchment paper. In a medium bowl mix flour, salt and baking soda and mix well. 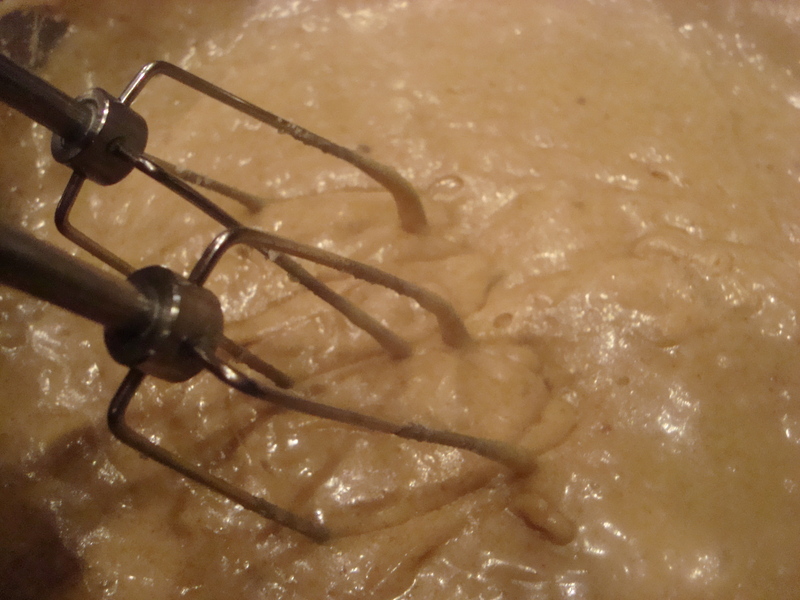 In a separate bowl cream butter, sugars, vanilla and eggs until light and creamy. Slowly add in the flour mixture until well incorporated. 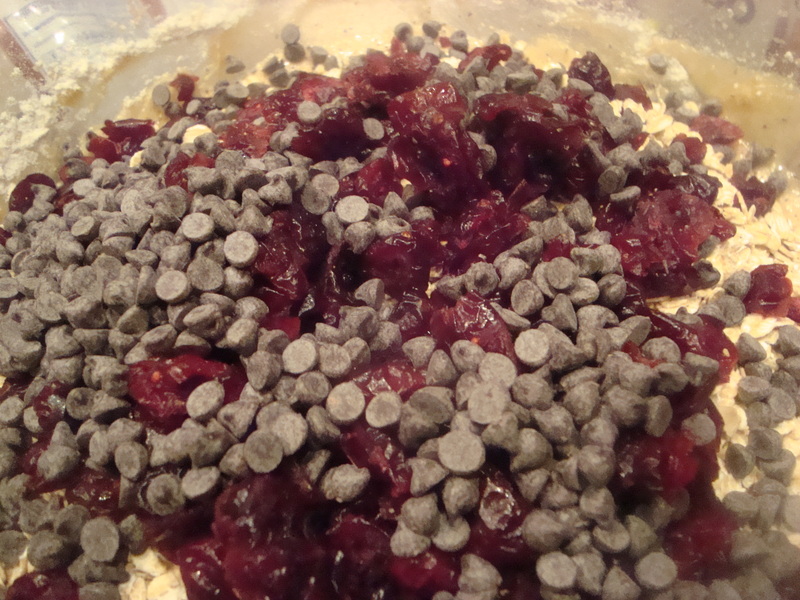 Using a spatula or wooden spoon stir in oats, cherries and chocolate chips. 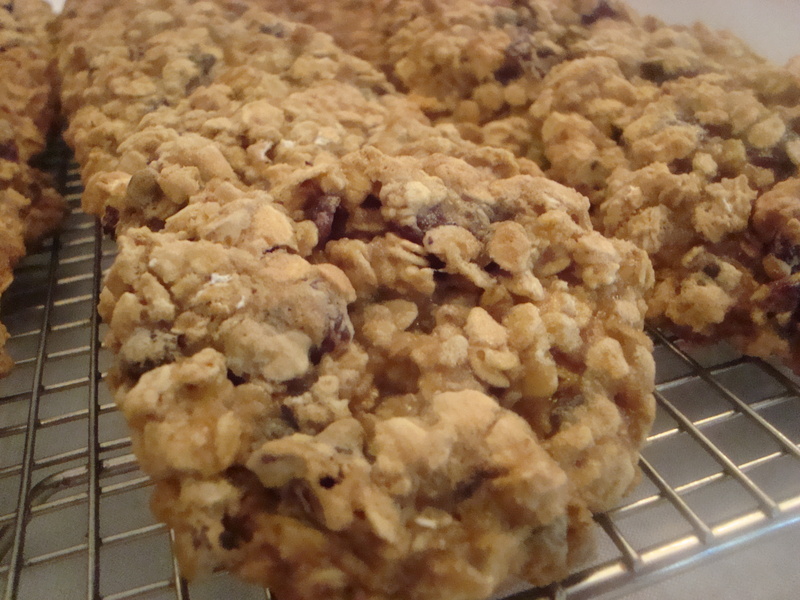 Using a scoop drop cookies 2 inches apart on cookie sheet and bake for about 11 minutes for chewy cookies or 13-14 minutes for crispier cookies. Transfer cookies to cooling rack to cool. Makes about 36-40 cookies. Also, have you ever tried this with white chocolate? I know white chocolate isn’t really chocolate, but I always like it with dried cherries! No I haven’t but I think it will be great with it. next time!! The end is so close, Tahmina! Do you know what you are going to eat first? Well, they look and sound good! It’s almost like reading blogs, because you can’t taste the food and must rely on other’s descriptions! I like dried cherries a lot, and esepcially with chocolate. Looks like a great cookie! Good luck with your cleanse! I love this combination. I hope you’re getting close to the end of your 16 days so you can sample them yourself! I’m going to freeze a few so I can try it later! I’m sure if you make it, you’ll put your amazing Kellie twist on it! How can you go for 16 days without food – will you be okay?? ?